News Directors: Broadcast access to VCU experts can be arranged through the university’s VideoLink ReadyCam studio. ReadyCam transmits video and audio via fiber optics through a system that is routed to your newsroom. To schedule a live or taped interview, contact the VCU Office of Communications and Public Relations, 804-828-1231. A team of Virginia Commonwealth University pediatric surgeons today successfully completed the separation of 19-month-old conjoined twins Maria and Teresa Tapia of the Dominican Republic. 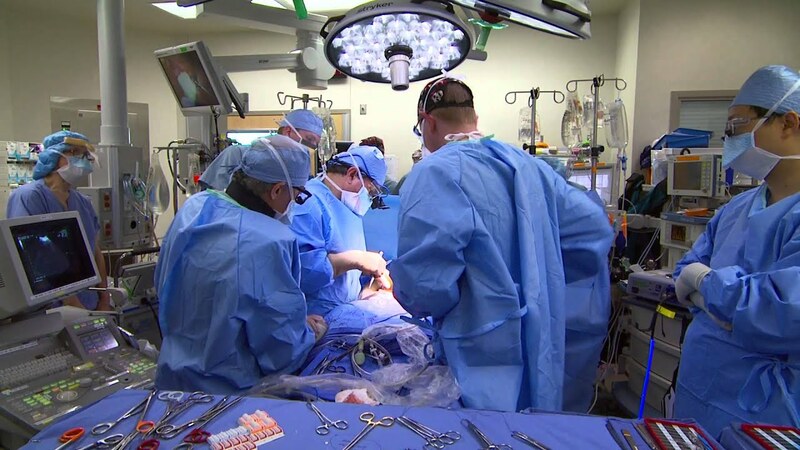 The complex, 20-hour procedure commenced Monday around 6 a.m. and was the first surgery of its kind at the Children’s Hospital of Richmond at VCU. Led by David Lanning, M.D., Ph.D., associate professor in the VCU Department of Surgery and surgeon-in-chief, the team was made up of about 45 physicians and pediatric subspecialists who volunteered their time. The twins, classified as omphalopagus, were joined at the lower chest and abdomen and shared a liver, part of their biliary system, pancreas glands and the first part of the small intestine or duodenums. "While there aren't really centers of excellence for conjoined twins because they're so rare, there is particular expertise here at VCU in all facets of complex pediatric surgeries, including separation of conjoined twins," Lanning said. "We also have worked for years with the World Pediatric Project, the organization that brought the girls here." According to Lanning, because of the nature of the twins’ connection with their duodenums, the smaller twin, Maria, was never able to receive the nutritional benefits she needed and was nearly 20 percent smaller in size than Teresa. Another one of the major challenges due to the shared liver was the lack of blood return to the smaller twin. Maria, Teresa and their mother first came to Children’s Hospital of Richmond at VCU for the twins’ initial evaluation in December 2010 through the World Pediatric Project (WPP) – an organization whose main mission is to link worldwide pediatric surgical, diagnostic and preventative resources to critically ill children in developing countries. After the twins returned to the Dominican Republic, Lanning and his colleagues in the months following began to carefully map out a detailed treatment plan and conducted comprehensive research on the twins’ anatomies to prepare for the separation procedure. This included studying MRI scans and imaging to determine the placement of the twins’ shared organs. At the end of August, the twins returned to Richmond with their mother and aunt and remained close to the hospital for additional exams, imaging and a procedure in which the surgeons placed tissue expanders in the twins. The balloon-like expanders enabled the growth of excess skin to be used for reconstruction following surgery. In the months leading up to the procedure, the surgical team carefully planned the step-by-step detailed operative timetable, which included specifications on times for the various aspects of the surgery. The team also designated separate colors for the bandages and tubing that would belong to each child. For instance, Maria was mango and Teresa, turquoise. The planning and support also extended beyond the medical community as several individuals and groups within VCU offered the twins their expertise. This included custom dresses created by the Department of Fashion Design and Merchandising; a plaster body casting mold made by a VCU Sculpture student to assist plastic surgeons in determining the best way to cosmetically care for the twins after separation; and a special car seat large enough to accommodate the twins for comfortable vehicle travel, which was designed by a VCU occupational therapist who also is a certified car seat technician. Following separation, Teresa was taken to another operating room and teams completed the final steps of the surgical process on each child. The girls were then transported to individual rooms in the pediatric intensive care unit for recovery after the procedure. Critical members of the separation surgical team also included Jennifer Rhodes, M.D., assistant professor in the VCU Department of Surgery’s Division of Plastic and Reconstructive Surgery and director of Children’s Hospital of Richmond at VCU’s Center for Craniofacial Care; Robert Fisher, M.D., professor of surgery and director of the liver transplant program; and Claudio Oiticica, M.D., associate professor of surgery. World Pediatric Project is a nonprofit, humanitarian organization founded and based in Richmond, Virginia, that provides surgical and diagnostic care to Central American and Caribbean children while creating and implementing programs to heal the children of tomorrow. This mission is accomplished by mobilizing hospitals and teams of generous pediatric specialists, who volunteer their time and expertise to help thousands of children who need critical care, yet have no access to it in their home countries. With the volunteer help of these dedicated doctors and nurses, World Pediatric Project brings children to partner hospitals in the U.S. and sends pediatric diagnostic and surgical teams to developing countries. Thousands of children have received direct services since 2001.